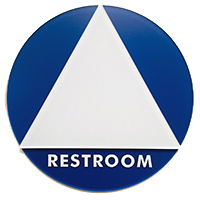 Several single-occupancy restrooms are located throughout the UC San Diego campus. Specific locations of single occupancy restrooms on main campus, SIO and Hillcrest are shown on this interactive map. The campus is in the process of replacing existing signage on all single-occupancy restrooms, in accordance with the UC Office of the President’s Guidelines on Gender Inclusive Facilities. Many people may experience difficulty, inconvenience or harassment when using gender specific restrooms and facilities. Parents with children of a different gender, as well as caregivers to persons of a different gender, face difficulties in accompanying them. New signage on main campus and SIO is pictured above. Updated ADA signs will be included where applicable. Note: Housing Dining & Hospitality and Medical Center facilities may have different sign designs. For more information, call Facilities Management Customer Relations, (858) 534-2930, 7 a.m. to 4:30 p.m., weekdays.